I graduated in 1993 from the Ontario Veterinary College and joined the clinic in 2004. An area of interest in veterinary medicine for me is internal medicine. My favourite thing about Clappison Animal Hospital is that I love the way the staff is one big family. We all love working with animals and with each other. What I love most about my job is medical cases, I enjoy the journey of diagnosing an animal and making it better. A fun fact about me is that I was born and raised in downtown Toronto, but got a degree in Agriculture at the University of Guelph; I was even on the square dance team! 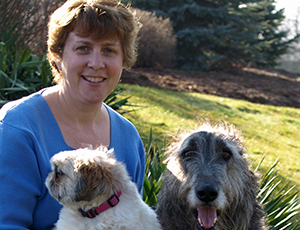 My love of animals made a career in veterinary medicine a natural choice. I have a husband and two daughters, who love animals and who help me fill my spare time. I enjoy taking my dogs for walks through the woods, identifying any birds and wildlife that we have not scared away. In 2018, Dr. Merry was awarded the Flamborough Reader's Choice Award for Gold Veterinarian.